Brilliant embodiment of style and elegance – this exquisite model Imperiale (REF: 384239-5002), provided in the case of 40 mm diameter in 18-carat pink gold. 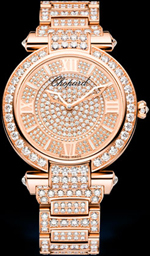 The magnificent clock, inlaid with diamonds, are boundless imagination of designers and craftsmen Chopard. With the advent of the clock, a springboard for a new vision and perception of time, you start a new process of invention, to which many have contributed the most original and brilliant contributions.